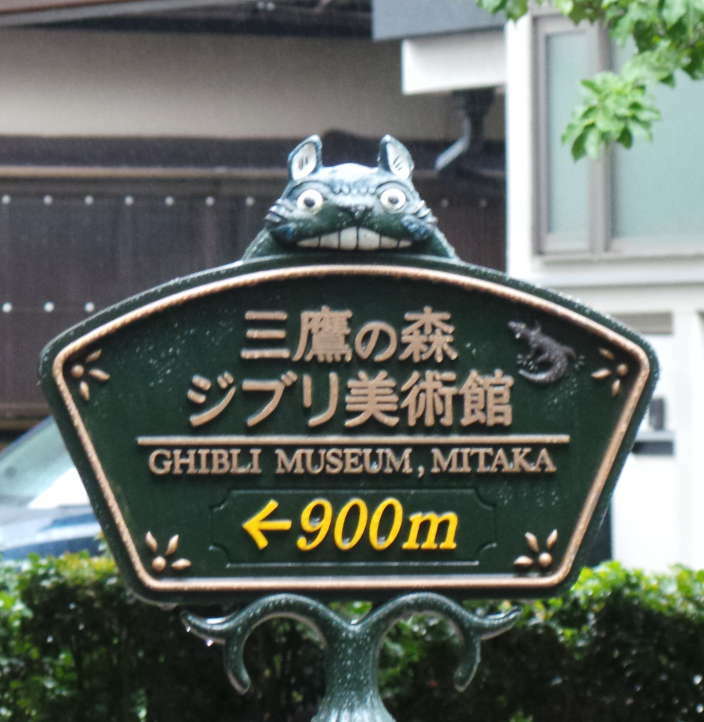 Not that long ago, Kyle and I decided that we were going to go to Studio Ghibli in Mitaka. And holy h---, WE HAD SO MUCH FUN!! Okay....I think I had a little more fun then Kyle did. Just a little bit more fun. We had been planning on going here for the longest time, and we FINALLY made it happen. There are a lot of things about this museum that are absolutely amazing! And the answer to probably the number 1 question is, no, this is not connected to the actual Studio Ghibli. That is located in Konegai. But, let's hop into this article. First thing that you need to know is how to get to the museum. The first step is to get to the Mitaka station. There is nothing else in the name, just Mitaka station. From there, you can either walk for 15-20 minutes, or you can take a 5 minute bus ride. The bus is not the CatBus (oh well), but it is still a cute bus. If you decide that you want to walk there, you will need to follow all the signs with Totoro on them. They are going to tell you which way to go, and how far it is until you get there. The area that the museum is in is really quiet and nice. It seems to be more residential than commercial, which is perfect (If you have seen any Ghibli movies, you know why I am saying this). The museum is next to a park, and you could just miss it if you aren't paying attention. 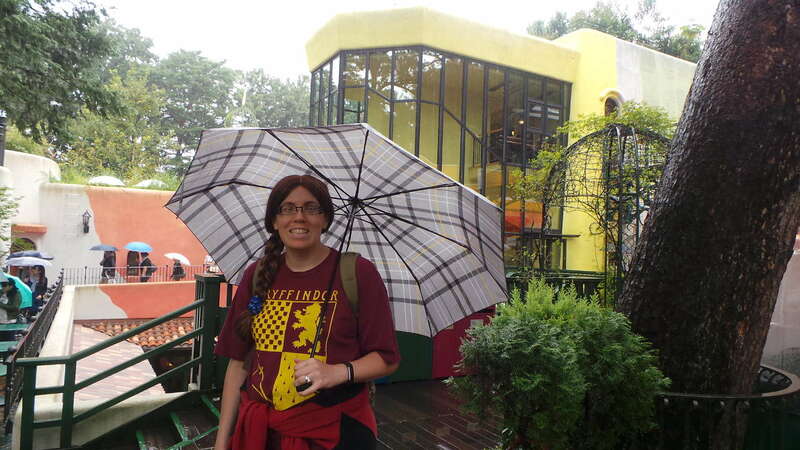 Tucked back into the trees and green, you will find the Ghibli museum. 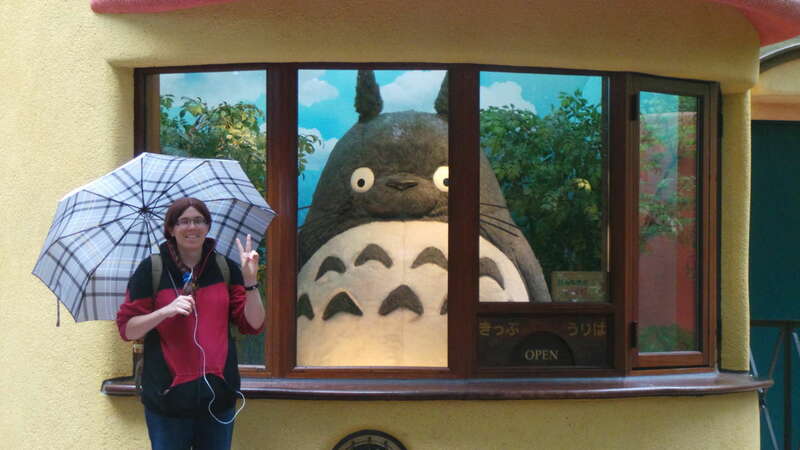 Totoro is going to be there to greet you, along with a few soot sprites. Make sure your ticket is ready (You have to get these before you go. No same day tickets – see below), and then you can walk inside. I felt like I was walking into Howl's Castle! The walls were a bright, cheerful yellow, and the ceilings were high! All topped with a Ghibli themed stain glass dome. An old Victorian elevator will take you up and down to the floors you need to go to, as well as a stair way and catwalks. Stained glass doors let in an amazing amount of sunlight, and all the pictures come from the movies and are in his style. EEEEEK! 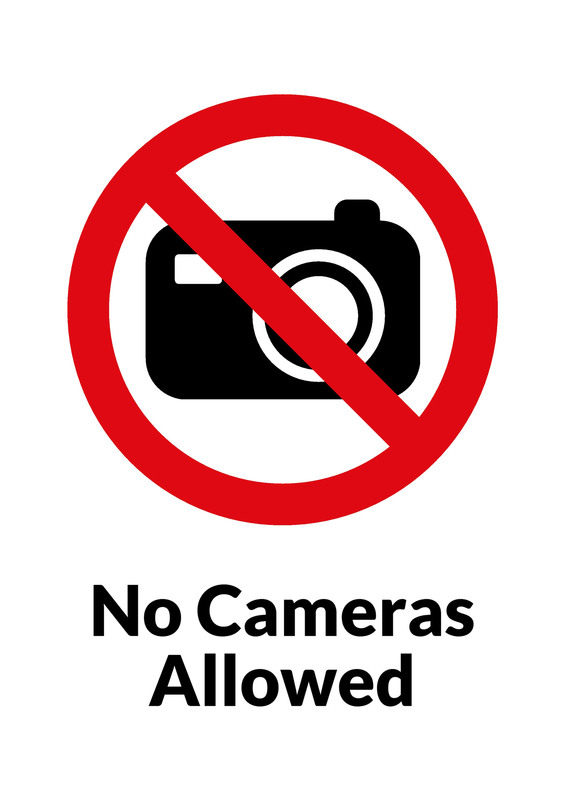 The museum has a couple of different areas that you can go to when you visit (but you can't take photos, so sorry...). There are 2 permanent galleries, a rotating gallery (right now it is talking about all the food in the Ghibli movies. They have the entire thing in English, though they are in little "menus"), an area that replicates his working space (it shows his inspiration pieces and pictures that he has drawn), and a replica of his paint studio. There is a room where you can buys books (mostly for children), a CatBus room (for ages 12 and under. DARN! ), a gift shop, rooftop garden (one of the Laputa robots is up there), and a cafe! Tips for the cafe: eat before you go. The food is EXSPENSIVE. It was around $21 for a hot dog, half a ham sandwich, two egg rolls, and no drinks. Yeah. The ham sandwich was like the one in Ponyo, so that made it kinda fun to eat! "Ponyo wants HAM!" There is another cafe, but that line can get kinda long, so you might just want to skip that one. The prices were also a bit much. When you first go into the museum, you will have to show your ticket. And they will give you a pamphlet (they have many languages), along with these small film strips. We had no idea what they were for (but we are going to get to that). We found one of the permanent exhibits that is all about animation, and what actually goes into it. There is a lot of spinning stuff in that room, and I almost got a little to dizzy. After that came the temporary exhibit, and that one was stunning. So the thing with the temporary exhibit is that it changes yearly. And this year happens to be about the food that Ghibli is famous for. All of the stuff on the walls is in Japanese, but there was a "menu" that the museum had made in English that translated what was on the wall. The whole room had kinda been set up like a small restaurant, with tables, and a small ramen style area where you could learn to hold your chopsticks like a Ghibli character. They actually had models of the food done by the same people that make the food models for restaurants. It was really cool looking at the food (replicated) in real life, not just one the screen. 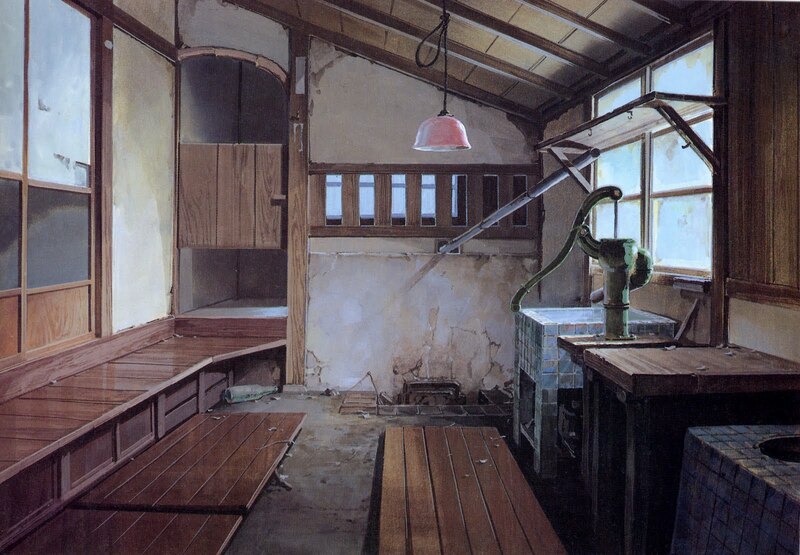 The coolest thing for me was the fact that there was a replica of the kitchen from "My Neighbor Totoro". The one in the old house! You could even go into it, though you had to take your shoes off to walk over the tatami mat. The other permanent exhibit is the replica of the working spaces. Those are so cool, and I want all of it! I thought it was interesting to see how they still use cells and backgrounds in order to do the animation. And the color selection! I never wanted to leave there. When we got up to the third floor, that is where we found the CatBus room (again, ages 12 and under. Grrrr), the library, and the gift shop. I will warn that the gift shop isn't that big, and there were A LOT of people in there the day that we went (it was raining. WHY WAS IT RAINING!). And the merchandise can be a bit expensive. Though there were a fair amount of chopsticks floating around. Not much I could do with that. I already have enough chopsticks to last me a while. They had plushies, models, shirts and bags. There were even some cookies! We didn't buy the cookies. After we were done with the inside of the museum, we went outside and walked around the gardens. It wasn't the best with all the rain falling on us. 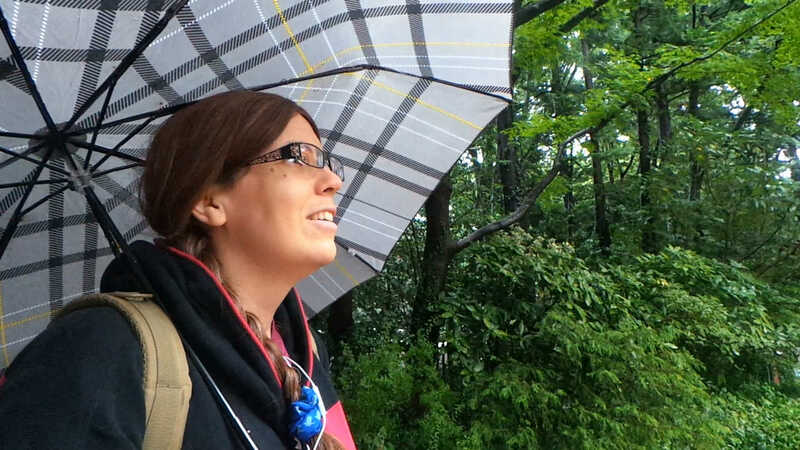 And yes, we did have umbrellas. We didn't get to go up to the gardens that day, but we did get a picture of the robot up there. The price of the tickets wasn't that bad. The museum was 1,000 yen ($10) each for us to go, not counting travel costs. The price continues to go down from there. And you have to get your tickets in advance. We got our tickets from the Lawsons in Sawara (they go on sale on the 10th of the month for the following month), and while there are other convenience stores that sell tickets to other places like Walt Disney Land and Disney Sea, Lawsons is the only place to get Ghibli tickets. As a destination site, you must go there if you can! Make sure that you have enough money though.....you could easily spend it all.